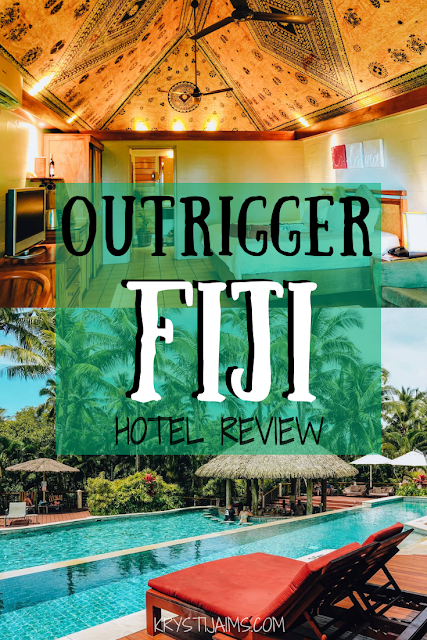 I recently spent three nights at Outrigger Fiji Beach Resort on the beautiful Coral Coast of the main island, Viti Levu. 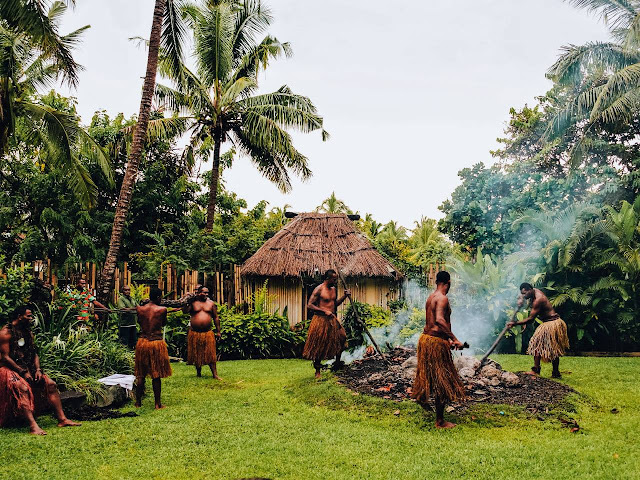 It definitely wasn't a long enough stay but it was a wonderful introduction for my first time in Fiji, receiving the warmest of Fijian hospitality. 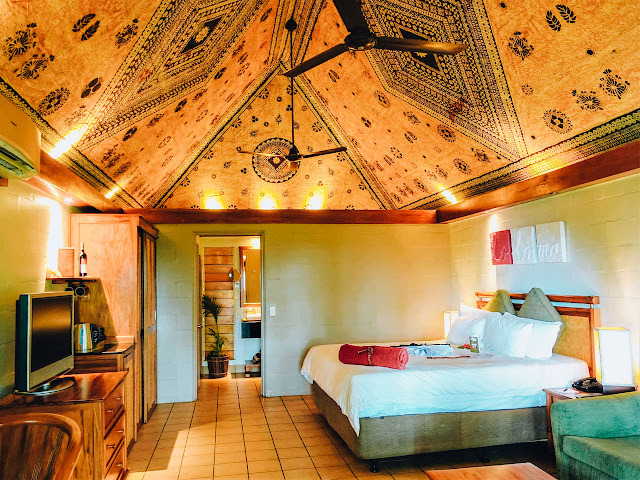 Set on an enormous property designed in the style of a traditional Fijian village, it's a secluded tropical getaway well-worth the 1 hour and 20-minute drive from Nadi Airport. 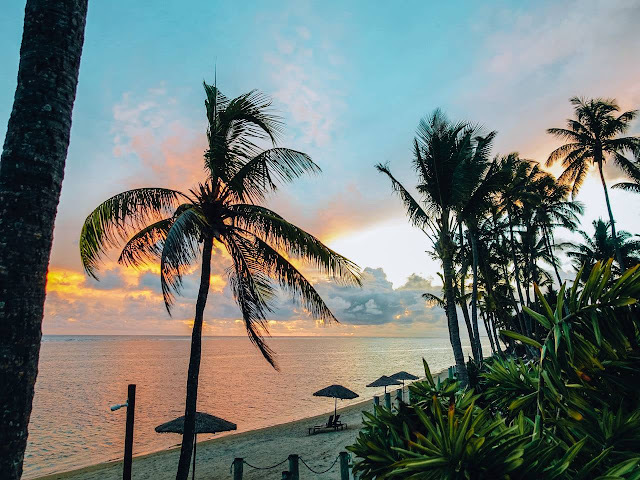 Complete with a stunning reef-fringed lagoon and white-sandy beach, incredible facilities, award-winning bars and restaurants, two pools (including an Adults-Only one - bonus! ), Outrigger Fiji is a resort that has it all and is the perfect holiday destination catering to all kinds of travellers on Viti Levu. My husband and I had pre-arranged a taxi directly through the hotel which made our transfer nice and easy. After a flight, it's not the shortest of drives but the lush scenery and seeing local villages along the way made it an interesting ride. 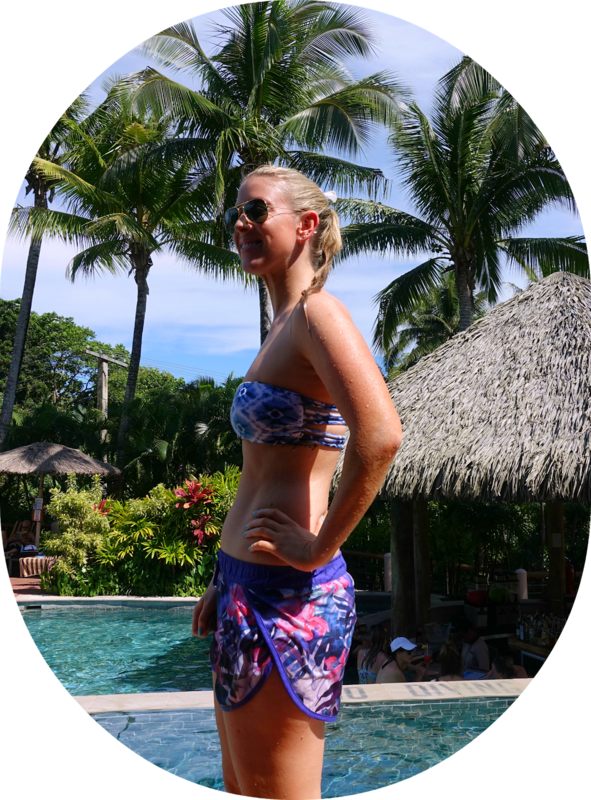 We eagerly arrived early in the afternoon and were warmly greeted at the entrance gate with a booming "BULA!" It was a welcome like no other that makes you grin from ear to ear. 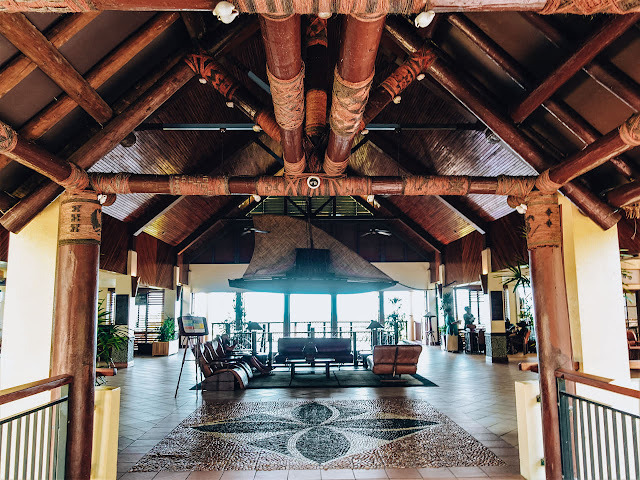 The lobby area was open and spacious with a beautiful traditional wooden ceiling. The check-in process was smooth and we enjoyed a refreshing welcome drink and a cold towel. Resort information was explained to us and we were given a handy map and a daily activities schedule. We were shown the incredible views over the resort, with important features pointed out such as pools and restaurants. We jumped onboard a waiting buggy cart and were transported to our room which was nice and close the waterfront. 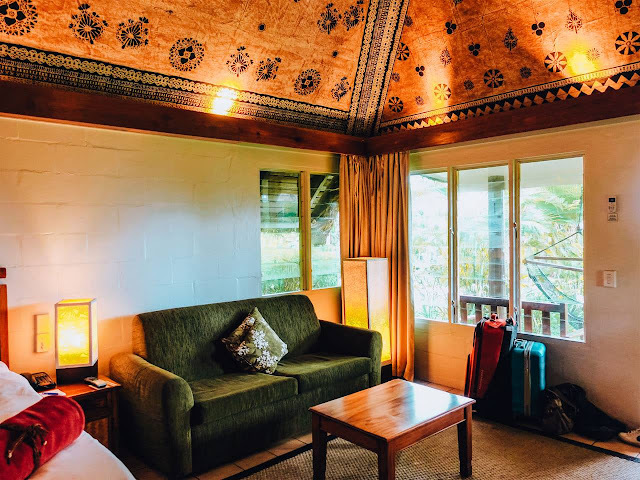 Our room was an Ocean Breeze Bure, a Fijian bungalow with a traditional thatched roof and a stunning hand-painted ceiling. It was extremely spacious with all the modern comforts you could want for in a relaxing getaway. The large king bed was very comfortable and the sleep quality was excellent. On top, some lovely welcome gifts were laid out for us. Next to the bed was a cosy two-seater couch and a coffee table. 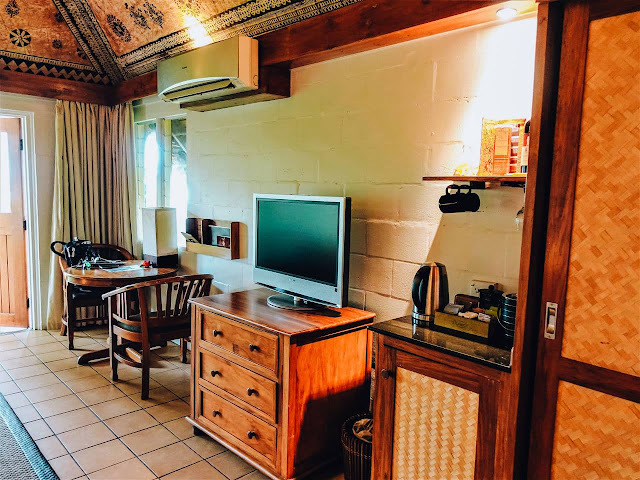 On the other side, we had a table and chair set, wooden drawers with an LCD TV on top, a minibar with a small refrigerator, complimentary tea and coffee making facilities, glassware and minibar items available to purchase. 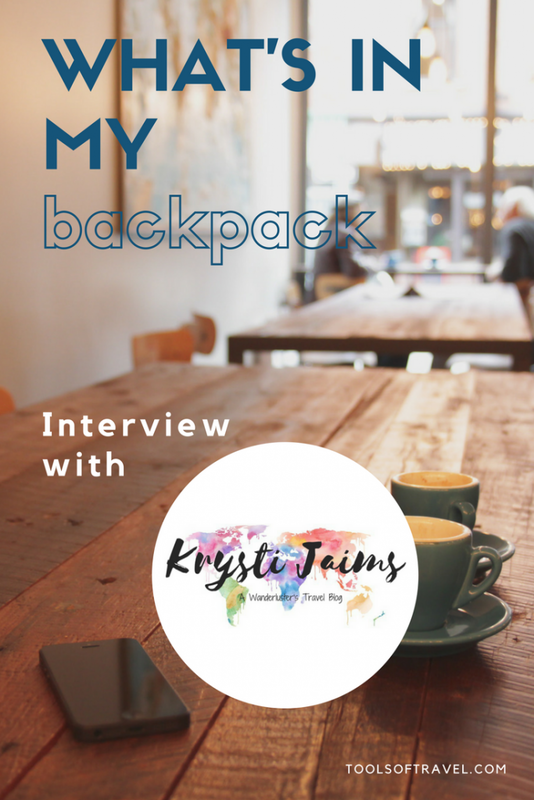 Next, stood a double wardrobe where you could find soft bathrobes and slippers, a safety deposit box, a hairdryer, an iron and board and even bug spray - they thought of everything. Through to the beautiful ensuite, on the vanity were good-quality complimentary toiletries. The toilet and shower had separate rooms on either side. 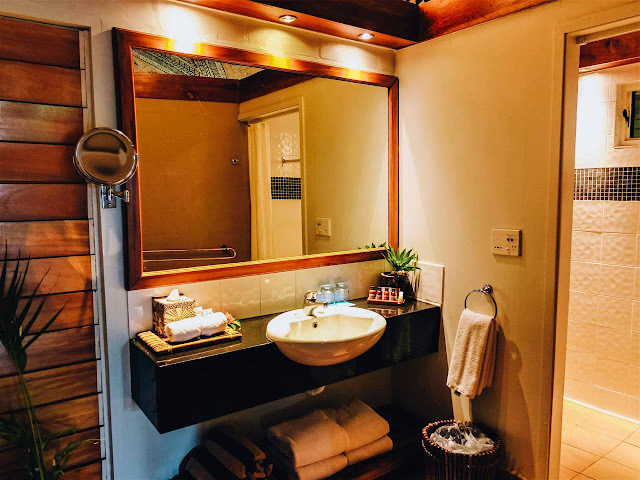 We had a full-length mirror as well as the large mirror above the sink and I loved the greenery in the bathroom. Other features of the room included air conditioning, a ceiling fan, alarm clock/radio and daily housekeeping. 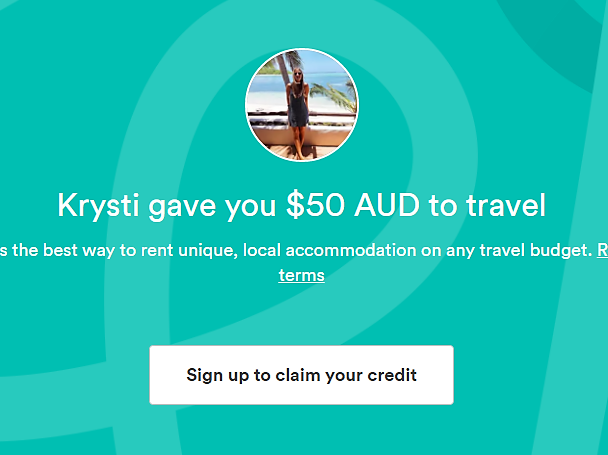 (Wifi is an optional extra for a fee). Also included for guests in deluxe ocean view rooms, bures and suites is a special Talai Butler Service. 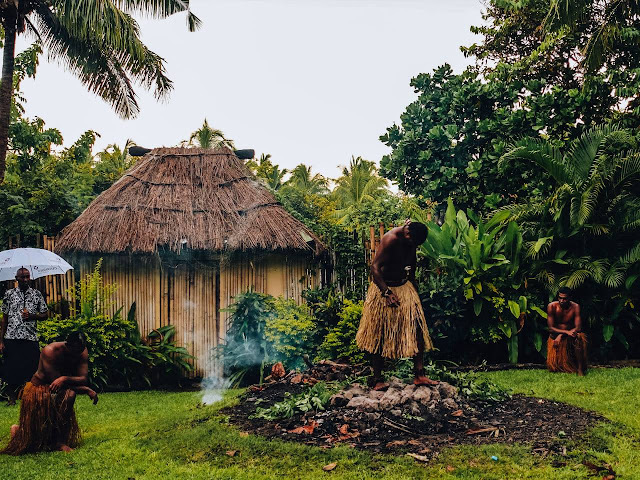 This is a traditional five-star butler service with a South Pacific twist. 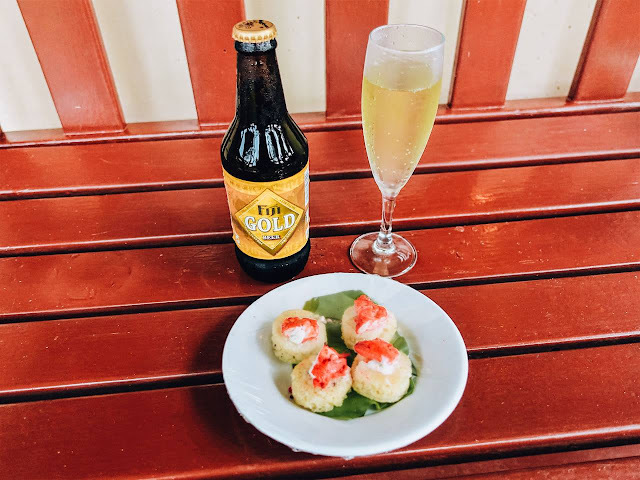 We had a fantastic butler named Jerry who delivered us bubbles (or beer for my husband) and delicious canapes to our room every afternoon. He was also available to help us with any reservations, tour recommendations and even unpack and iron our clothing if we wanted him to! We also had an evening turn-down service and nightcap drink and dessert, which was a real treat. 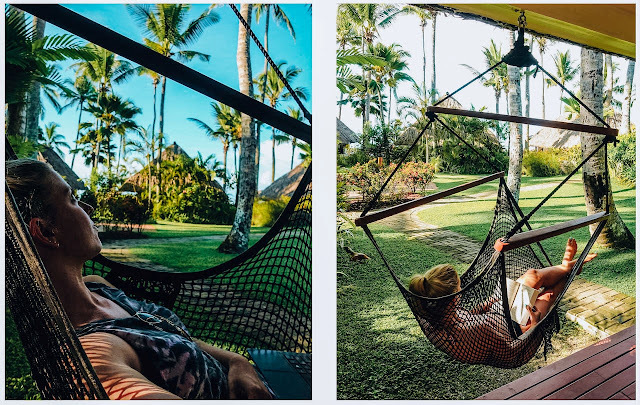 At the front of our bure we had a porch with a wooden bench and, my favourite part - a hammock. It was a wonderful touch that gave that ultra tropical holiday vibes and it made our room all the more relaxing. I loved that though we had neighbours in surrounding bures, it was in a very quiet area and the separate gardens and well-placed plants made it feel very private. 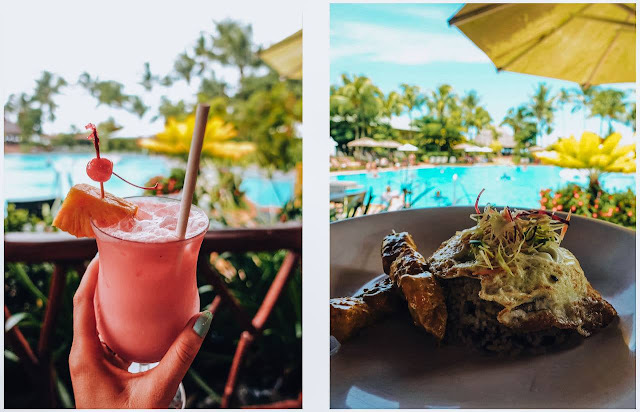 There is so much on offer at Outrigger Resort, you can easily stay for over a week and enjoy different things to do every day without feeling the need to go anywhere else. 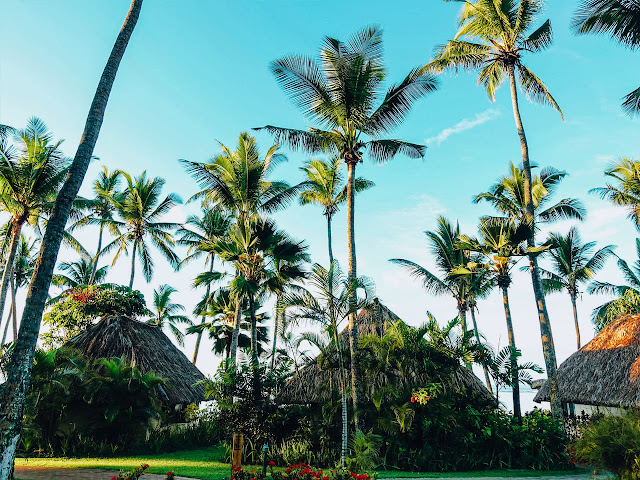 Opening in 2000, it was Fiji's first five-star resort, with 207 rooms and suites and 40 beachfront and plantation bures spread over the 16-hectare property. 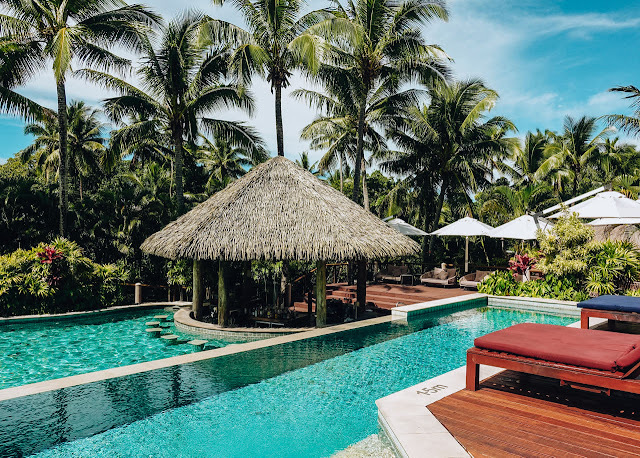 Outrigger Fiji is fronted by a white-sand beach and a stunning reef-fringed lagoon, lined with balmy palm trees. 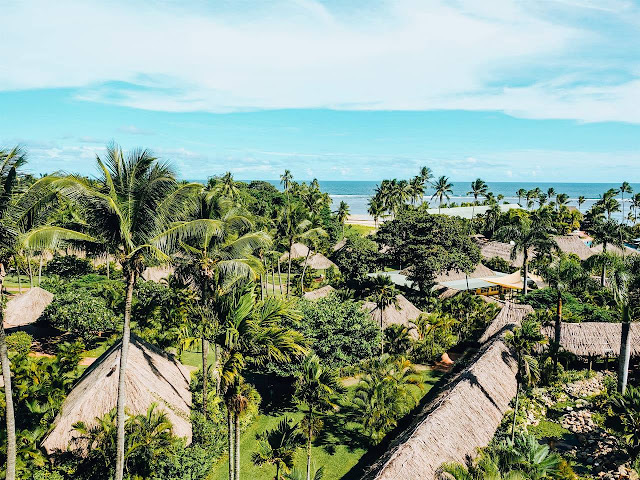 Throughout, the resort is brimming with lush tropical manicured gardens, little pebbled rivers and trickling waterfalls. There are not one but two swimming pools to enjoy. 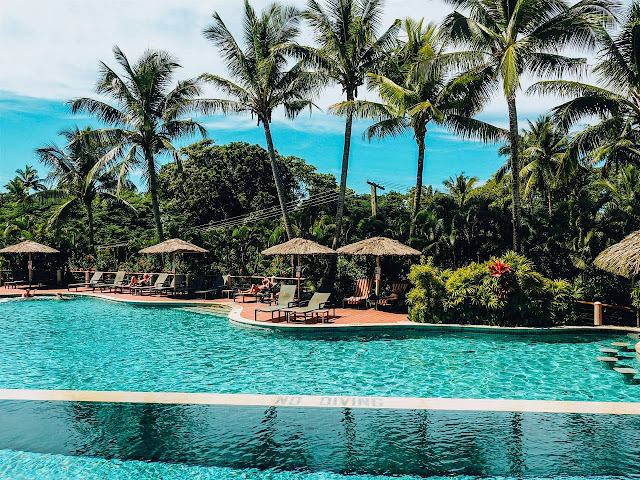 One is a family-friendly pool that is one of the largest in Fiji, offering all sorts of activities for all ages. The second and my personal favourite was the Adults Only pool, which has two-tiers, a swim-up bar and its own on-site restaurant. With plenty of sunbeds and loungers for all to enjoy, it was the perfect area to relax and soak up some rays. 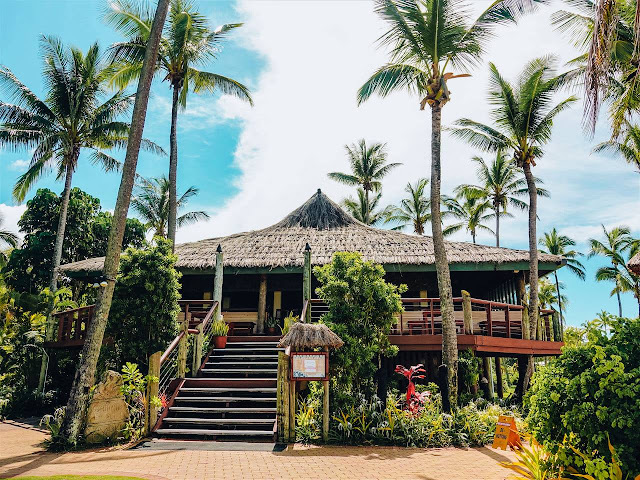 For those with children, it is very easy to see what a brilliant resort Outrigger Fiji is at catering towards families. 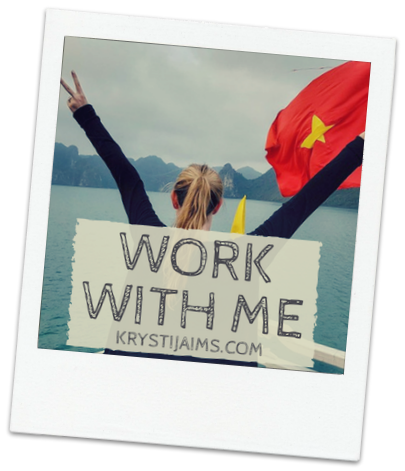 There is a Kids Club and a fantastic Meimei Nanny Service, with one nanny per child, they receive customised and exceptional care for a very reasonable price. 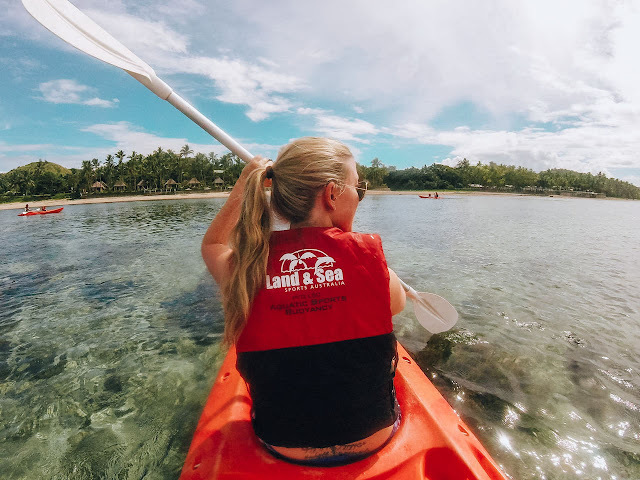 At the Activities Desk and Dive Shop, you can sign up for daily diving excursions and complimentary watersport activities like snorkelling, kayaking and paddleboarding. 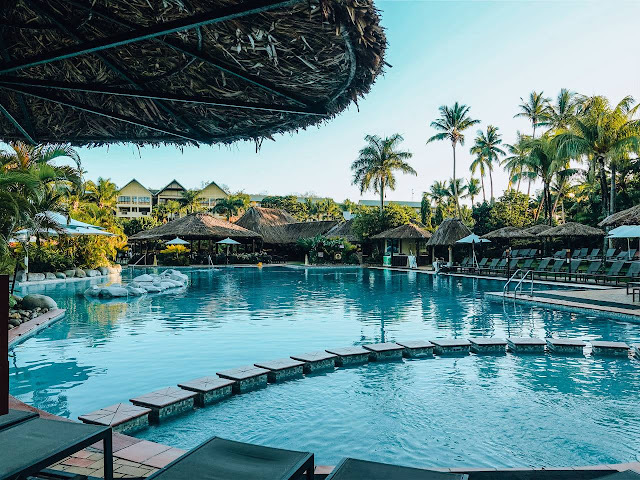 With a Fitness Centre, tennis court, a nearby golf driving range, and even a volleyball court - there's something active for everyone (if you feel the need to take a break from all of that relaxing). You can also join in on daily cultural experiences, such as a traditional fire-walking show. 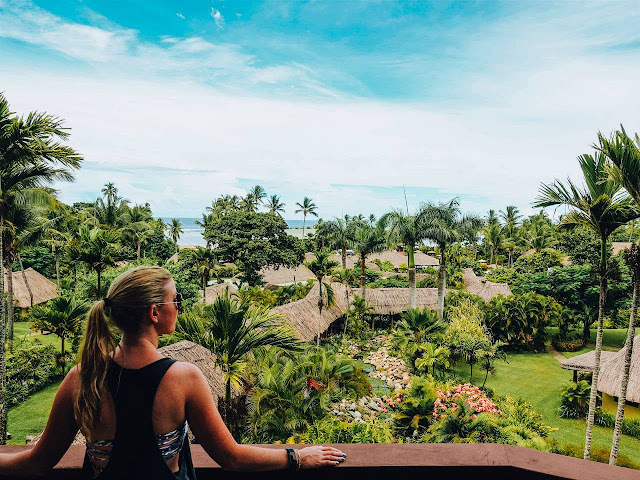 Just a few of the many other activities available include guided reef walks, coral planting, introductory yoga, water aerobics, sarong painting and coconut bowling. Onsite there are also retail shops, guest laundry, a medical centre, conference and meeting rooms. 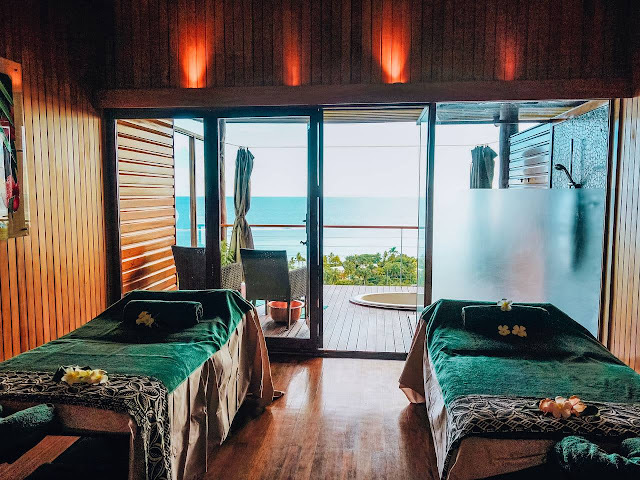 For that ultimate holiday experience, you can't miss the beautiful Bebe Spa, meaning 'butterfly'. 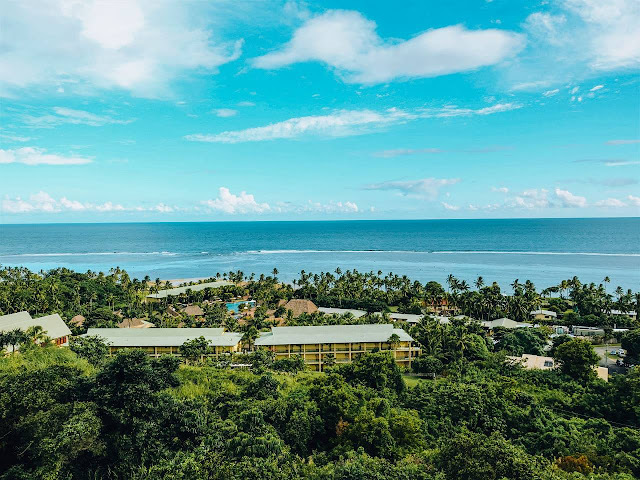 Sitting atop Vakalomalagi Hill, it has captivating, sweeping views of the ocean and resort below. 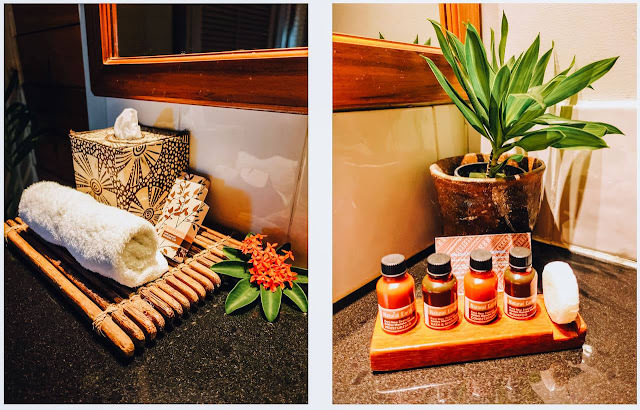 With different signature treatments available, they proudly use indigenous ingredients and techniques fused with the finest spa products from Pevonia Botanica. 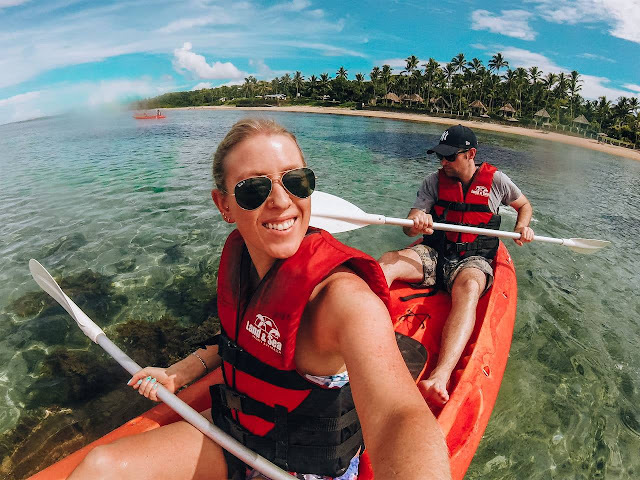 Outrigger Fiji is also a popular destination to get married in and they offer a range of romantic wedding packages and vow-renewal ceremonies. There are five restaurants and bars available to choose from, all serving a range of fresh, high-quality and delicious local and international dishes. 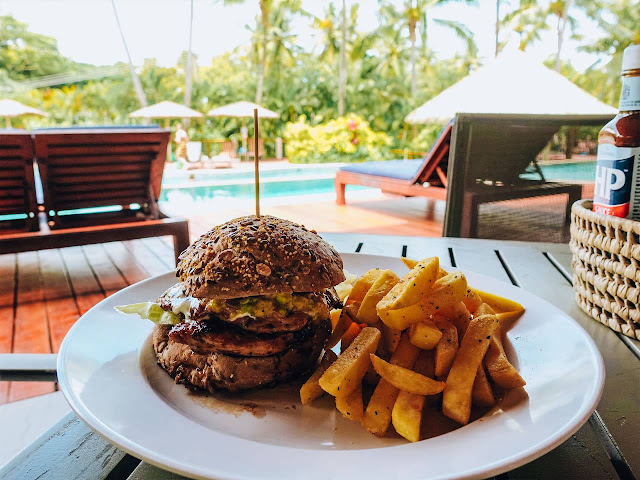 My husband and I enjoyed eating casual lunches at Baravi Poolside (by the main pool) as well as at the adults-only Vahavi Bistro. For dinner, we loved the Sundowner Bar with peaceful seaside views. It's the best place to enjoy a sunset cocktail and I highly recommend their woodfired pizzas and melt-in-your-mouth baked cheesecake. 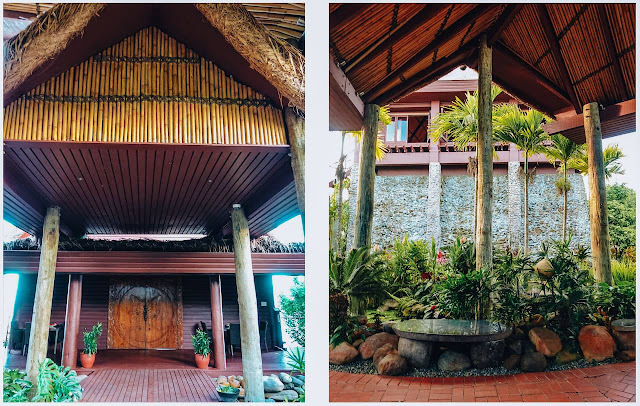 There's also the signature and award-winning Ivi Restaurant, the Vale Ni Kana Restaurant and the Kalokalo Bar. A daily Happy Hour takes place at Baravi Poolside from 4-5 PM, where you can indulge in all beverages at half price. 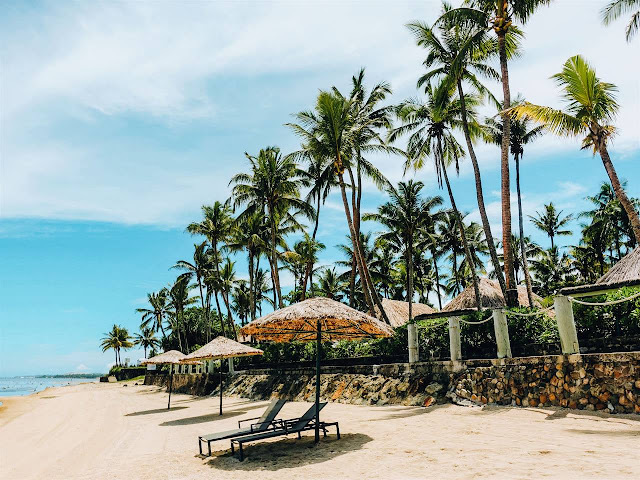 Outrigger Fiji Beach Resort is an out-of-the-ordinary holiday experience. 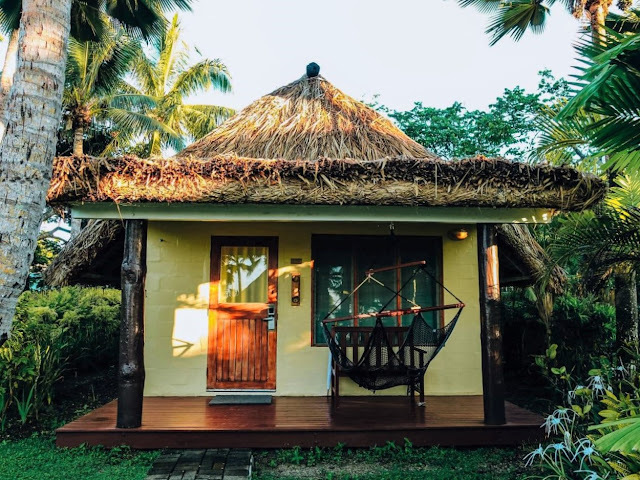 They have so much to offer to ensure all kinds of guests - from families with little ones, groups of friends to couples seeking a romantic getaway - have a perfect and memorable stay. 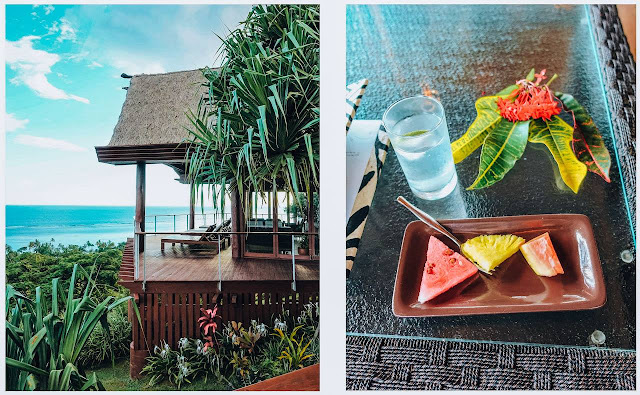 My husband and I had the most relaxing time and loved our Ocean Breeze Bure. The Adults-Only zones were a huge plus for us, as was the delicious food and exceptional hospitality we received. A special mention goes out to our Tailai Butler, Jerry, who was incredibly friendly and made our stay all the more special. We were super impressed with the wide range of facilities and daily activities on offer, we only wish we had of stayed longer! 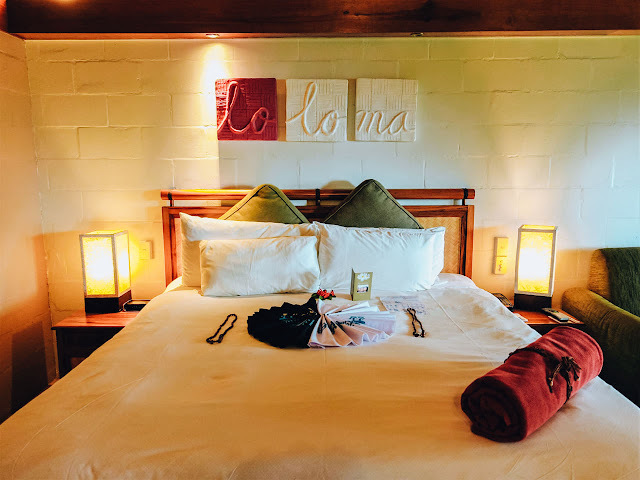 It was an absolute pleasure to stay there and I highly recommend it to anyone looking for an all-inclusive resort on Viti Levu, that is unique and charming with authentic Fijian hospitality. 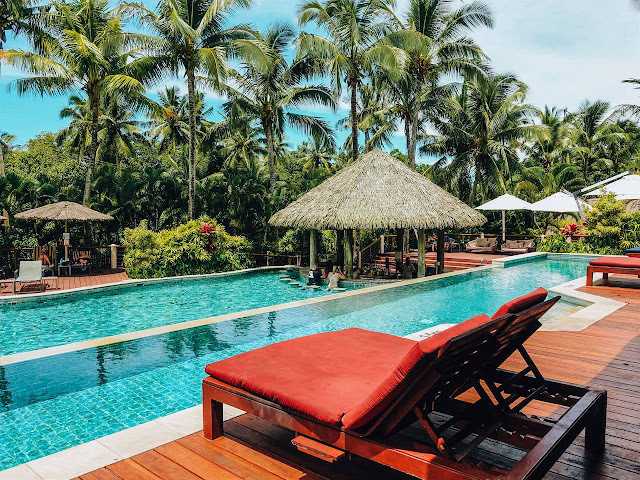 Outrigger also have hotels and resorts in Castaway Island Fiji, Hawaii, Maldives, Guam, Thailand and Mauritius so be sure to check them out if you're heading to any of those places! 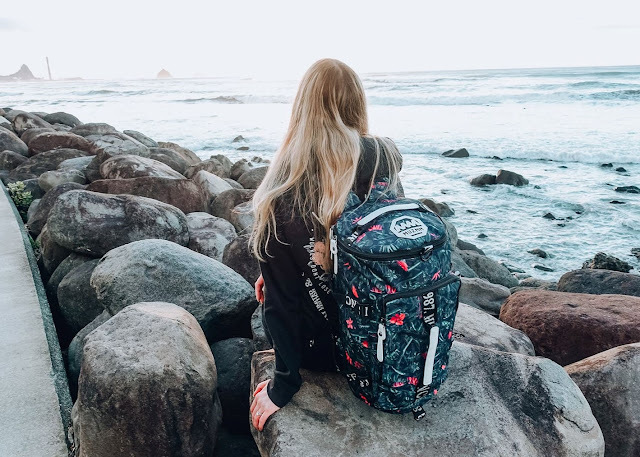 what a lovely place, to explore, with the experience to go along with it. I really can see me enjoying my stay there for a month or so. 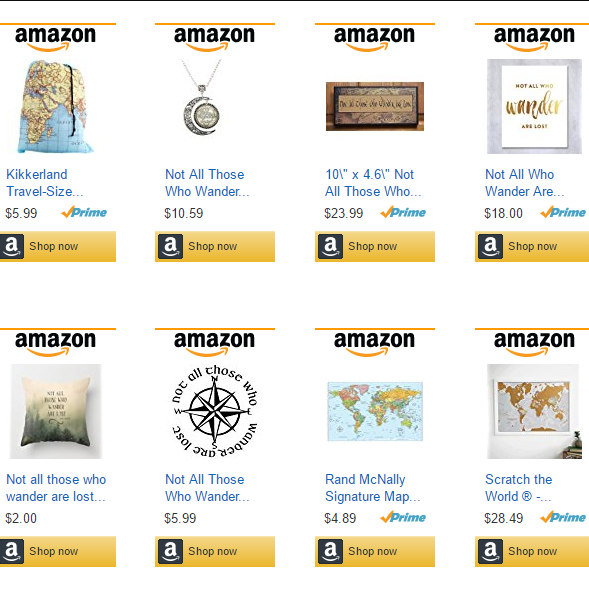 That looks like an incredible place to visit! I would love to visit Fiji some day. 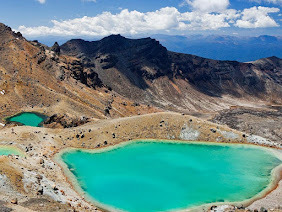 The water looks amazing there! 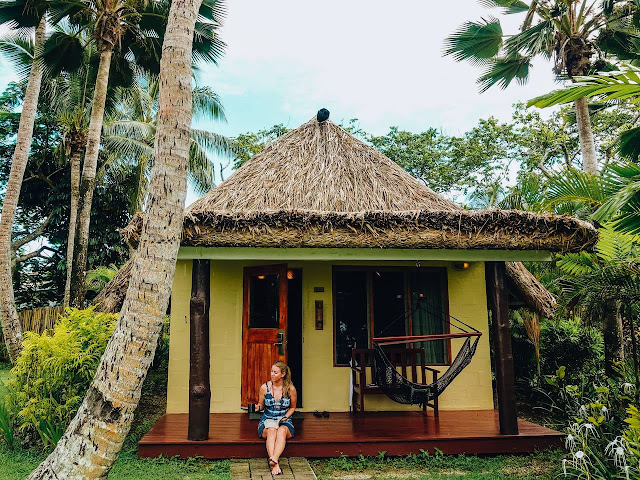 15 photos to inspire your next holiday in Fiji!